Have questions? Search our frequently asked questions page to determine if your question has already been answered. If your question has not been answered or you would like more information then use this contact form. But please check the above first! Your contact form questions are routed to members that can best respond and responses will have varying originating email addresses. If you have filters on your email, a response may not come through. We receive numerous requests from different species' animal welfare, rescue and appreciation organizations to post their information on our site. 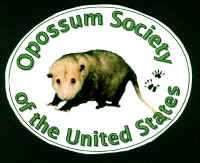 We request that any resource suggestions be directly related to the Virginia opossum, its habitat, food sources, predators, human interaction and environment concerns.There are so many worthy causes and concerns, other than the opossum, but we want this resource section to be specifically about Virginia opossums.